All of our staff are carefully chosen based on their readiness to be provide safe, caring, and fun-filled experiences for campers. 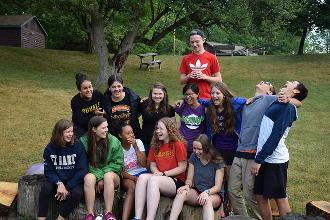 Staff are committed to the emotional and physical development of each and every camper. The process of becoming a Canterbury Hills Camp staff member includes: 1) written application; 2) interview; 3) reference checks; 4) submission of a Police Records Check with Vulnerable Sector screening; 5) Participation in a staff training weekend and full staff training week; 6) Mentoring and supervision provided by our senior Resource Team. All of our employed leaders have Standard First Aid & CPR level C (babies, children and adults) certification. We are proud of our staff who facilitate magical and memorable camp experiences each week of the summer. Staff bring a camper-centered approach to their leadership as they supervise campers and adventures. 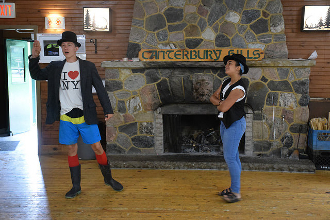 Serving as a camper leader is a meaningful, challenging and rewarding opportunity that includes signficant growth and development with a positive community of peers. To discuss staff practices or opportunities, contact our Camp Director.